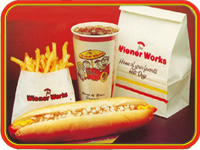 Sign up below to become a member of the Wiener Works Click Club and you'll receive the tastiest savings in town! As a reward for joining our CLick Club you'll be emailed whenever we have a batch of new coupons posted online. Don't worry we won't flood your inbox with emails, we'll only contact you with big news and coupon announcements. Click the register button below and sign up for all the savings!